In early August, Belgian Trappist brewer Chimay announced its 150th anniversary beer, called Spéciale Cent Cinquante, which (roughly) means “special 150” in French. Chimay’s Spéciale Cent Cinquante is a pale, Belgian strong ale, and it looks like it’s hitting U.S. store shelves now—albeit in very small quantities and only in certain states. Chimay reportedly only brewed 12,500 cases of this special anniversary Belgian ale, and the United States will only see 2,500 of them, according to a press release from Hunterdon Distributors, which sold its allotment of 500 bottles in a single week. 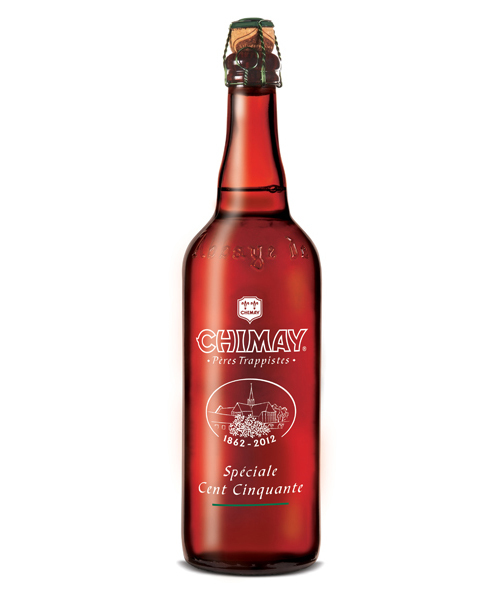 Chimay Spéciale Cent Cinquante will be available in Virginia, Florida, California, Kansas, New York, Massachusetts and Puerto Rico, according to Hunterdon, but it seems likely other distributors will ship the beer to additional U.S. states. Looks exquisite. Do you know if they will be exported to the Netherlands?! I was in the tiny Belgian town of Chimay this summer and it is definitely one of the best Trappist breweries. Can you get their cheese in the States? You should keep an eye out, it’s really something special. I honestly don’t know if Speciale Cent Cinquante will make it to the Netherlands or not. I just picked up a bottle of my own in Boston, MA, but I haven’t tasted it yet. I’m planning on cellaring it for a while. I was on Chimay’s website recently, looking for cellaring information for this ale, and I saw a page with Chimay cheeses. I didn’t know they made cheese, and I’ve never tasted it. I don’t think you can (easily) find it in my area, but I’m definitely intrigued now. Yes, I am aware of the sites that ship Belgian beer to the US and elsewhere, but the cost of shipping makes buying beer from these sites cost restrictive. Some US states also have local laws that make it illegal to ship beer to these states. I wish neither of these things were true. I’d buy a lot more beer this way if they weren’t.